Since the days of colonization, Americans seemed to have a natural inclination to expand west. A lot of this was brought on by personal motivation for various reasons. 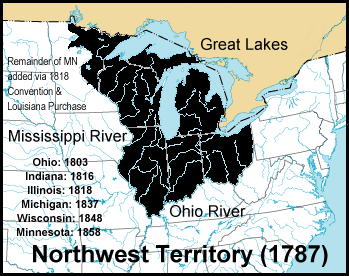 However, since the days of the Country’s founding, lawmakers sought to address the issue of slavery as more and more Americans fulfilled their “Manifest Destiny.” In 1787, the Confederation Congress passed the Northwest Ordinance. In this organization of territories north and west of the Ohio River, Congress officially banned slavery in the new territories, except in the case of convicted criminals. However, it would not be the last time Congress too on the issue in relation to slavery’s expansion. In 1820, not long after the Country’s inception, Congress attempted to quarrel a brewing sectional controversy revolving around the statehood of Missouri. Missouri’s inclusion in the Union as a free state or a slave state would upset the balance of power between the two sections of the country. Henry Clay, “The Great Compromiser,” worked out a three part compromise to ease tensions. The Missouri Compromise dictated that Missouri would enter the Union as a slave state while Maine, after breaking away from Massachusetts, would be introduced as a free state. Lastly, the rest of the Louisiana Territory would be divided by the infamous 36-30 parallel. Slavery could exist North of that line. This eased the sectional controversies over this issue, for awhile. Thirty years later, after the Gold Rush of 1849 caused California’s population to swell, the state applied for entrance to the Union as a free state. This served to escalate tension brought on after the acquisition of land from the Mexican-American War. Some argued the 36-30 parallel line extended to the Pacific while pro-slavery advocates were quick to point out that the line only applied to the Louisiana Territory. Henry Clay introduced another compromise. The Compromise if 1850 mandated that California enter as a free state while the rest of the territories acquired in the late war would decide the fate of slavery in their territories using popular sovereignty. The compromise also dictated that the slave trade would be outlawed in Washington D.C. and that a stricter fugitive slave law would be enacted. Although the Compromise of 1850 did not actually solve the dividing issue, it did prevent Civil War from eruption ten years before it did. Talks of secession died down, and Congressman stopped pulling guns on each other in Congress….for awhile. Then in 1854, tensions escalated yet again. Territories north of the 36-30 line of the Louisiana Territory were off limits to slavery. Numerous attempts to bring some of those territories into statehood were repeatedly stifled by Southern Congressmen wishing to preserve the status quo. Stephen Douglas’s Kansas-Nebraska Act was an attempt to politically maneuver around that issue. The act overrode the Missouri Compromise and allowed slavery to spread by popular sovereignty. This action had harsh consequences. Pro-slavery and Anti-slavery groups moved into the area to swell the votes for each side. Bearing these events in mind, I often wonder about how “Bleeding Kansas” is taught in school. In general I think it is usually a build up to the firing at Fort Sumter; the event most consider to be the beginning of the Civil War. It is a comfortable point of no return. I know many teachers, including myself, who usually teach leading up to Ft. Sumter, and then test over issues leading to the Civil War. Afterwards, they teach Civil War (Ft. Sumter and beyond…) through Reconstruction before assessing the students again. I wonder if beginning at Ft. Sumter is the right move. With so many people that insist the Civil War does not simply end but spills into Reconstruction, I wonder why the same cannot be said about “Bleeding Kansas.” In Kansas, these people fought in a civil war for over a decade over the same exact issue that lead to the American Civil War. There is little divide between those events, and the ones that lead us up to the precipice of war. You have the same sectional crisis and violence among competing governments and their supporters. All of these are factors that mark the Civil War as well. After revisiting this issue, I think I might end next year’s unit after the Compromise of 1850 and start my Civil War unit in 1854, when the violence starts. I think this might add greater continuity to the lessons. What do you think? I think it is right to teach about how Bleeding Kansas was actually the first stages of the Civil War. It brings up some interesting questions. Why were people willing to kill each other over the issue of slavery? This is not a state’s rights issue. It was about allowing the people to make a choice. The pro-slavery side could not allow that choice to be made. That brings up the question again about why people were willing to kill over slavery. We already know why the slave owners desperately needed slavery to expand. Here is where we can cut out the crap about northern aggression, state’s rights, and all that Lost Cause garbage. Look at Kansas in the 1850s. There is the answer to why there was a Civil War. It also explains why slavery was the cause of the Civil War. The issue of slavery is more an issue of blacks. It isn’t that the North didn’t want slavery particularly, especially as New England had profited so much from the slave trade itself. What the people of the North DIDN’T want were blacks in the territories. There were those who hated the institution, but they hated Southern whites (even those who DIDN’T own slaves!) as much as they hated the blacks. Of course, they had no problems with their own people who owned slaves (see New Jersey et al.). The problem was two different countries with two different understanding about what made a nation a nation. In the beginning, New England attempted to secede three times but changed its mind. (Too bad!) There was no “civil war” – that is a war to take over a nation – rather, the South decided (rightly so) that it was time to leave what had become a hostile, hateful and corrupt government stealing its wealth through taxes and attempting to create servile insurrection. The Southern States had every right to leave. Indeed, the upper South would probably NOT have seceded had not Lincoln required them to commit treason (according to Article III, Section 3 of the Constitution) by providing troops to invade the Cotton States. I had a reply typed up, but something about the content of your comment rang familiar. I saw the same response from Lady Val on Brooks Simpson’s blog. Then I checked your IP address. I’m curious Lady Val, why the alias? You make some asinine points though. 1. Interesting thought the Federal Government somehow committed treason against itself. 2. Please provide a citation for the statement from Professor Jay Hoar. Treason was not disobeying the federal government, but waging war against the States – which is what Lincoln and his government did. When the documentary on Lincoln comes out, you will be able to hear the good Professor give it himself. He is being interviewed in that documentary. It’s not an “alias.” It is my mom de plume. My name is Valerie Protopapas and I have written a great many things under my own name. Lady Val just shows up on some sites. As for asinine, NOTHING is more asinine than refusing to accept the facts because they don’t agree with your opinions. Correction, Lincoln waged a war against rebels; which is Constitutional and well within Presidential powers since states have no power to wage wars themselves. 2. Does it really matter? Have you found yourself a good ol’ boy professors to refer to since he takes your side? What a joke. Sounds like another Di Lorenzo type. You have presented no facts, you’ve only ranted. I’m sure next you’ll post something ridiculous about the Corwin Amendment. How did Lincoln cause the states to secede? He only called troops up after the Confederates attacked federal property at Ft. Sumter. If you would check your historical documents (aka, the facts) you will see that seven states had seceded prior to that assault. Also, what taxes? There was no federal income tax. New England never attempted to secede. There was grumbling and some talk, but when a convention was called as in the case of the Hartford Convention in 1814, only one pro-secession delegate was elected to the convention by the people. That says a lot right there. Then at the convention there was no mention of secession at all. Unfortunately, the fictional part gets promoted instead of the actual reality. You are trying to reshape what actually happened in the past to fit what you want to believe. The facts show us what happened. Those facts do not support your opinions. The states never lost their sovereignty. They willingly gave that up when they joined the Union in 1789 under the US Constitution. It was made clear in the ratification debates and all 13 made the choice to do so. The loose confederation idea had already been tried and found seriously wanting prior to that decision. Interesting comments, all. So perhaps I may offer a few. Everyone these days is so sure it was precisely slavery that caused our tragic, less-than-civil war. But France, England, Portugal, Brazil, Cuba, et al all had slavery…and eventually got rid of it without resorting to war, Brazil waiting until 1888 for total emancipation! Only Haiti joined us in using war to end slavery. So how did we differ so tragically from these other nations? What ELSE (or WHO ELSE!) grabbed, polarized, and embittered the American nation, eventually plunging us into four years of conflict that would leave 700K dead? I would also observe that in classic debate those who employ argumentum ad hominem tactics on fellow debaters….as I see above….automatically lose the argument…and often their credibility. Hi Scott, thanks for commenting and the follow. I’ve heard this argument numerous times, mostly from Libertarian advocates such as Ron Paul. There are flaws in such an argument. The United States was a sovereign nation with internal issues regarding slavery as opposed to a colony. Our industrial revolution was sectional as well, with Southern powers maintaining the slave based agricultural system. This ideological and economical sectionalism manifested itself during a time of expansion as well. This meant that for every additional slave and/or free state added to the Union, added the consequential vote in Congress. Those votes became section more and more so as the 19th century drug on. A fight for a slave/free state, was a fight for votes sectional votes in Congress. In the case of Britain, their industrial revolution rendered the system of slavery practically useless internally. They had a market cornered on finished goods. It’s actually listed as one of the results of their industrial revolution. Other countries have numerous reasons for ending slavery and they are all historical studies in their own right. There is, however, one important comparable difference when focusing on America. In America, a large portion of the country quite literally fought to preserve slavery. Many of the Southern states became slave societies as opposed to a society with slaves. That meant that the social order and Southern caste system was based on slavery and a white man’s right to own a black slave. Social orders are usually worth fighting for; and fight they did. Also, you need to reexamine argumentum ad hominem. None of that appears in this post. I think Cassandra is right and the issue in Kansas was whether Lincoln would keep his promise to keep Kansas for whites. Lincoln had said he wanted the land for white people, and many of the people wanted him to keep his promise and keep the blacks out. If the Southerners brought a black labor force to Kansas, that obviously would mean that Kansas would not be a white enclave as Lincoln promised. And Kansas really had no effect on the Civil War, because the Civil War was fought over whether or not the states would be allowed to separate from the union (like the colonies separated from Great Britain). After all, if the war was fought over slavery, that would mean the slave-holding states would have fought the non slave-holding states, but that didn’t happen. Instead, the war was fought only between the states that tried to separate from the union and the states that did not separate from the union. At least that much is pretty obvious. If slavery was the reason the war was fought, why did the war begin only AFTER some of the states left? Why didn’t the war begin in, say, 1816, or 1822, or 1837, or 1849, or 1852, or 1859? In all of those tears, and in every year in-between, slavery was in existence, but there was no war. So it’s pretty obvious that slavery was not the reason the war was fought. I would love to reply to this comment, but I’m not going to. You see, you have an IP address and location that is fairly similar to Austin/Caldwell/Reed/etc., a noted troll who hides behind fake handles on the internet. Perhaps if you sent some information (Facebook page, Twitter page, etc. ), that might legitimize who you are, I would be glad to respond. Until then, I’m going to assume you are “Austin,” the it that likes to hide on Connie Chastain’s blog where she will protect it. Then why did the people of 1860/61 tell us in their own words that it was about slavery? Let’s not entertain it until it learns some manners. Ah, I wanted to find out why states seceded over whether or not they could secede. I haven’t found anything by anybody in the secession years that said that’s why the war was fought. It seems kind of silly to fight a war over whether a state could secede or not. Just about as silly as seceding over secession, but that seems to be what that person wants people to believe. I also would love to know what Lincoln said about Kansas as a white enclave and see the source for that statement. No clue where he is getting that from. I’d be interested in a source as well. Now if it were a Free Soiler, then I would have no doubt in believing such a statement. No Lincoln more than likely held Free Soil ideology back in the 1830s, when he and other Whigs supported the American Colonization society. However, in 1854 he was still a Whig, and not a member of the Free Soil Party. He was a member of a dying party however, the Kansas-Nebraska Act deeply divided the Whigs. 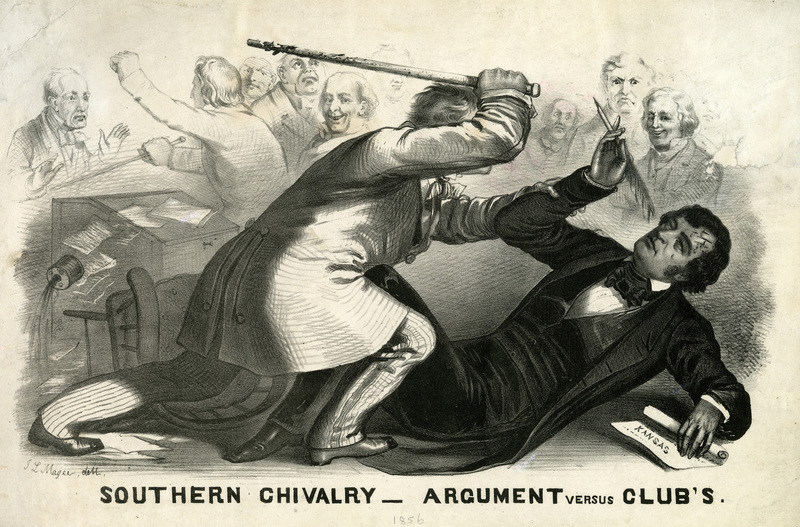 However, Lincoln was able to turn a stagnant career around because of the deterioration of civility in Kansas, due in large part of Stephen Douglas’s bill. P.S. You should see the incredibly childish comment I received for editing the swear words out of “Austin’s” last comment. It’s absolutely ridiculous that this moron assumed he can hide behind his fake identities and expect to be taken seriously. I am thinking about posting this comment anyways, it’s just too ridiculous. Don’t know what the  you are talking about, but I can certainly see why you have so few posters. Evidently, everyone who disagrees with you has their IP address “checked”. You are a . Do you really have the sheer audacity to demand that I send you Facebook information for the “privilege” of posting here? Go  yourself! Sorry Austin, er, I mean DarleneT. I hope you won’t mind the editing of your comment. It’s particularly hard to make sure people can get their point across while limiting the amount of profanity; especially when it is in insult form. By the way, that’s not very appropriate language for a lady. Facebook information is as little as providing the link to your Facebook page to see whether or not you are a real person, using a real name and real e-mail address. Like I said before, I’m not going to bother to respond to any “points” you make whilst you continue to act in such a trollish manner. Darlene, Austin, whoever you are; you are not allowed to comment here until you use your real name. We’ve had this conversation before, remember? Oh, I’m sorry, did you expect your comment to be here? It’s hilarious that you think you can show up here with the same watered down, moronic and asinine statements you always use and pretend to be someone else. You’re like the emo kid stomping off to your room telling everyone that you “hate them.” It’s quite sad really. Everyone knows it’s you, so why bother trying? Now run along back to Connie to rant and rave. Seems there’s been a bit of dissension on here since I posted last time. Differing points of view are more than often, how we learn, how we expand our understanding. All of the colonies had slavery going into the American Revolution….gradually eliminating it where it was growing less and less financially feasible…starting in New England and moving south as the decades passed. There would be no war based on slavery in those times, especially when we had to confront the Redcoats! Yet after winning independence, the states agreed to banish the international slave trade in 1808. A good first step for the nation as a whole. But radicals in both the North and South fueled this emancipation fire, emphasizing differences, pointing fingers, invoking God and goodness, and eventually hate…to achieve their goals. Regarding my missive over argumentum ad hominem, Mr. Baker’s rather sharp description of one correspondent’s points as “asinine” rather fits the bill…and is totally inappropriate in a blog of this nature. But if he disagrees, I would only offer a bit of wisdom from my grandfather….He who is unaware of his ignorance…will be mislead by his knowledge. Indulge me if you will. Why is it, than when I type your email into Facebook, another person comes up? Wars are caused by ideologies or to be specific, people with ideologies. That is a relatively new development in human history and one which we can see in the American Revolution. We already know who caused the Civil War. Sane people were trying to prevent a war. Insane people were hauling guns to Charleston and placing them in position to attack Fort Sumter. Their leader, Jefferson Davis, gave the order to attack the fort. There was no reason to attack the fort. So why did Davis give that order? The fledging confederacy was not a unanimous creation. A very big portion of its people opposed leaving the Union. Many of them would fight for the Union. The secession conventions were quick affairs meant to push the issue of secession over slavery very fast before people stopped to think about it. They had begun to think about that choice and were having second thoughts. The reality was that some states were going to go back into the Union as the anti-secession types were being heard. Eight of the fifteen slave states had not left the Union and without them the Lower South had no chance of success. Davis needed that war and Lincoln was not obliging him by attacking the South. Davis was running out of time. Lincoln had all the time in the world. The pressure was on Davis from the slave owners who controlled the political power in the South. They had gone all in with secession. If their venture failed, their power was gone forever. The North was not playing into their hands. The North had bent over backwards to placate the slave owners, but that wasn’t good enough for them. They needed that war to make their gamble succeed. Since the real issue was the expansion of slavery into the western territories, the question becomes what was going to happen there? That was the property of the United States of America. The US was not going to transfer that territory to the Confederacy. How was the Confederacy going to expand slavery without a war? Despite the wishes of some in the New Mexico Territory to join the Confederacy, the US Constitution clearly established federal authority as supreme in all US territories until those territories became states. Therefore, for the Confederacy to gain the New Mexico Territory, they were going to have to fight to take it. So there was going to be a war or there wasn’t going to be a confederacy. It is pretty simple. I’ll have to disagree with your conclusion, Jimmy. Wars are never simple. And in this case, our Civil War began “brewing” several centuries before 1861, coming to a boil in the 1830s. Yes, despite what you may believe, it’s really people who cause wars, not horrible practices, greed, murders, racism, and all of the other human faults I might name on here. We have all of these terrible things all the time….yet peace still covers most of the earth. (I’m sure you can name a “few examples!”) It’s the final arrival of INTOLERANCE…where we/they will no longer stand these terrible things that leads to man’s worst solution at solving a problem. Not that I have any other solution for what we should have done after 7 December 1941 or with Nazi Germany. Sometimes war is the only way left…but then, as we can all agree, humanity is not perfect. And in the case of WW2, it worked. Well, if you want to make it like this, no problem. One group of people wanted slavery to end. Another group didn’t. When the group that wanted slavery to end became a majority, the other group wanted to break the laws of the country and secede. They failed. Now who is responsible for the Civil War? The people who opposed slavery and wanted it to die or the ones that wanted it to live on? When we have a difference of opinion we don’t secede from the US and attack the other sides property. That is what happened. 1.) In what way does focusing on who, tell us anymore than the focus on what? 2.) What does this have to do with “Bleeding Kansas,” and teaching? Well, dissension has come primarily from a troll who continues to pop up here using different user names. To focus time on “who” caused the Civil War rather than “what” is a deflection. We know “Who” caused the war thanks to the neat timelines, personal memoirs, letters of those involved, policy makers who made mistakes, and pseudo-Presidents who ordered an assault on a Federal fortification and federal troops. wars are fought by people, not ideas…and they are caused by people INTOLERANT of the differences they perceive in other people. I’m somewhat confused by this comment. You say that wars are “fought by people, not ideas”; wars caused by people who are “intolerant” of the differences they perceive in other people. So wars are fought by people over their ideas of differences? In your example, ideas about what is appropriate and not appropriate differences in others. Regardless, I disagree. War is policy by other means. An army is merely the sword of the state, using said sword to execute it’s policy. Policy is usually founded in idealism. Hitler may be responsible for WWII (debatable since the Japanese had been attacking Asian countries prior to his ascension to office), but without the prevalent Nazi ideology that gripped many Germans (Anti-Semitism, anti-Treay of Versailles, anti-Wehrmacht [the great stab in the back], anti-Communism, etc.) he would never have come to power. Slavery was still a very divisive issue at that time. It took a back seat to more prominent issues. The nation’s first step, as you put it, is somewhat of a farce. The International Slave trade was allowed to continue so Southerners could replenish their slave numbers. British policy caused a massive decline in slavery during the war. Georgia’s population on the eve of war was 50% slave. It took until the eve of the Civil War to come close to those numbers again. It also did not entirely end once the international slave trade ended. Yes, but no one individual so earned the ire of various sections as the issue they discussed. Slavery. I called her statement asinine, which is in no way the logical fallacy of ad hominem. If I would have called her a “loon,” arguing that her comment was irrelevant because she is a “loon,” then that would be ad hominem. That is an attack on the person’s character in order to discredit her argument without actually addressing the argument. But arguing that her statement is incorrect, stupid, moronic, asinine, etc. is anything but. I called her statement what it was, asinine (extremely stupid or foolish) because it was just that. You can fault me for providing no counter argument, but I’m just not going to entertain such statements that are so off base anymore. I’ve done it too many times on this blog and elsewhere and it’s such a drain. Now back to my earlier question, why are you using alternate Screen Names to communicate on different blogs like this one and Andy Hall’s? As for my ID…what does it matter if I use a pen name? Government clearances rather insist on such practices, sometimes layers deep… (sorry, I don't know who Andy Hall is) But understand that your continued "curiosity" on such matters detracts from real discussions and ultimately drives your readers and potential contributors away…. I have blog rules that are clearly defined on my About Me page. Would you like me to email you a screen shot of the kinds of comments I get from fake handles? It is just one example of why I do not allow people to hide behind fake names. You don’t know who Andy Hall is? Curious. I always wonder why a blog post starts out one way such as on Kansas and quickly goes somewhere else when people want to repeat the same old tired garbage about the Civil War. When it does deal with Kansas we don’t see anything with any facts, just a claim whipped up out of thin air. It’s the same people with the same crap. No sources to support the claims either.